This is it, people! It’s my birthday month! It’s also the month when the first tale from Pocatello will be published. And you probably care more about that fact. The best gift you can give me for my birthday is to buy one of my books and then recommend it to your friends. 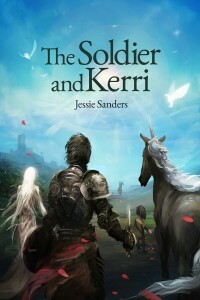 The Soldier and the Kerri is the first in a series of short stories that I am publishing. Which you already know if you’ve been paying attention. This amazing cover was created for me by Adam Ferrando. He took a short excerpt from the story and created this scene. Mr. Ferrando’s style was a great choice for the rugged and passionate feel I wanted to give this series. And in case you missed it earlier, here’s the synopsis for The Soldier and Kerri. Look for it on Amazon sometime this month! After three hundred years of oppression, the brave natives of Nerja finally gathered the strength to fight against the magical country of Malaga. Now the war is over, but the years of violence still affect both lands and their inhabitants. Alejandro and Kerri are just two of the many refugees looking for a new home amid the devastation. The two of them must band together if they are to escape the ruined Malaga and make it safely to the newly freed country of Nerja. But even as they journey through Nerja, forces both external and internal are trying to drive Alejandro and Kerri apart. Will this soldier be able to win another fight, or will he and Kerri be separated for good?